I have 39 years performance and recording experience. Let me entertain you, whether it is a party, club or retirement living facility, folk, country, oldies or contemporary, set lists can be custom tailored for the occasion. 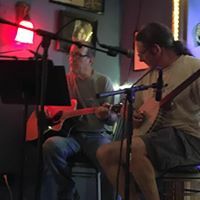 Instruments I play include vocals, guitar, bass, mandolin, banjo, sitar, pedal steel guitar, lap steel guitar, uke, balalaika, citera, cuatro, psaltery, bowed psaltery, lute, citole, harmonica, tin whistle, and dulcimer. I am also available for fill-in gigs. I have played guitar, bass, and lead vocals for many cover bands over the years. My repertoire is vast and varied. My repertoire includes solo music from the 50s, 60s, 70s, and 80s, along with various other gems written in the last few decades and countless songs of all styles and eras performed with various bands. ​I also learn special songs upon request for the occasion.